Allan Wood is the author of “Babe Ruth and the 1918 Red Sox”. Wood began his writing career at 16 years old, as a sportswriter for the Burlington (Vermont) Free Press. After moving to New York City in 1987, he worked as a freelance music critic for eight years. In addition to “Babe Ruth and the 1918 Red Sox”, Allan has contributed to several books published by the Society for American Research (SABR) and was a contributing writer and editor of “When Boston Had The Babe”. His writings on baseball, music and politics has appeared in numerous magazines and newspapers, and he has contributed to HistoryCommons.org’s Complete 9/11 Timeline. 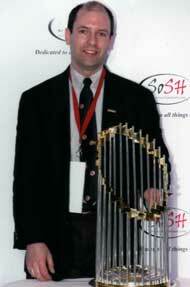 Wood lives in Mississauga, Ontario, where he writes the popular Red Sox blog “The Joy of Sox”. You can learn more his book and purchase it in Section 13: Books, etc. Allan talks about his passion for writing. Wood share his reasons for writing a book that focuses largely on the Babe. Allan shares some of the stories he learned from the interviews he conducted with people that knew the Babe personally. Wood discusses his impression of the Babe, both as a player, as well as a person. Allan shares some interesting information that he learned during the research process for his book. Wood gives his opinion on the media’s portrayal of the Babe. Wood talks about who compares to Ruth. Allan share his thoughts on Babe’s ultimate impact on the game of baseball.